Take your medical career to new heights and your life to new adventures at the Alaska Native Medical Center, one of the nation’s most unique hospitals located in the nation’s most unique state. Our nurses provide culturally appropriate, family-centered care in a unique hospital environment. Among ANMC’s health care team, our nurses are viewed as respected partners, collaborators and leaders. They are constantly seeking ways to improve the services and care we provide, from processes and initiatives to technology and equipment. More than 80 percent of our front line nurses hold Bachelor of Science in Nursing degrees and 45 percent have received specialty certifications. ANTHC is the largest, most comprehensive Tribal health organization in the United States, providing a wide range of high quality health services all aligned to reach the achieve its vision that Alaska Native people are the healthiest people in the world. Work with fellow primary care providers, other diverse health care professionals, and the Native Community to achieve wellness through health and related services. Crothal Healthcare, a premier healthcare support services provider, employs individuals in housekeeping and patient transport/lift positions. NMS Food Services is a leader in developing innovative food service solutions, and offers a variety of positions on the ANTHC campus. Working together with the Native Community to achieve wellness by providing the highest quality health services for all Alaska Native people. 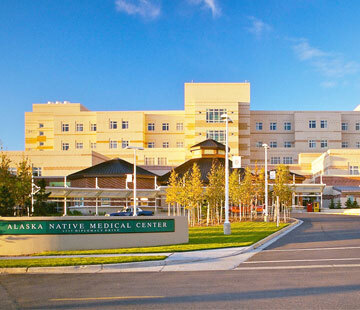 The Alaska Native Medical Center (ANMC) provides comprehensive inpatient and outpatient medical care to Alaska Native and American Indian people. ANMC is jointly owned and managed by the Alaska Native Tribal Health Consortium (ANTHC) and Southcentral Foundation (SCF), and includes both the hospital and the Anchorage Native Primary Care Center.